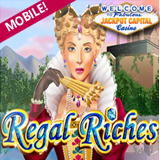 Take a spin back to the Renaissance with the new mobile slot game at Jackpot Capital Mobile Casino. With Castles, Minstrels and of course Crown Jewels spinning on its reels, and a sound track of Medieval music, Regal Riches will transport you to another time and place. This new mobile slot game, the latest from Realtime Gaming, takes mobile casino players back to the Renaissance with a luxurious game that’s generous with free spins and multipliers. It's been really popular since it arrived in Jackpot Capital’s online casino last summer and now there’s a specially enhanced version for those (like me!) that like to play on the go on our iPhones, iPads and Android phones. To access the mobile casino enter http://m.jackpotcapital.eu in the web browser on your mobile device. In Regal Riches, an elegant royal Lady is a stacked Wild. The Scatter is a stately Fountain and can trigger up to 25 free spins with multipliers increasing with each spin, up to 25x. Players can bet as little as a penny per line up to max bet of $25 per spin. Either of two random jackpots can be hit at any time, even if there is no winning combination.